IN his continuing search for the more weird, wacky and wondrous in the world of travel, David Ellis says the Canadian city of Calgary that holds its annual 10-day Stampede every July, should add "Cooking Oil Capital of the World" to its title. Because here just about anything that you can eat or drink is also available deep-fried: and not just main courses like that usual old chicken, fish, battered savs and fries, but hamburgers too. Plus all forms of confectionery, desserts… and Coca Cola. 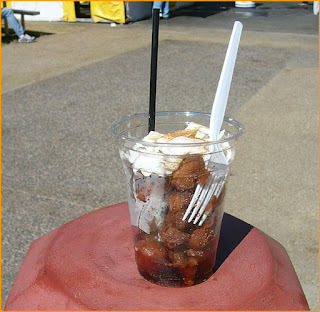 Yes, Deep Fried Coke is a specialty of dozens of stall holders at the Stampede: the Coke is mixed into a batter made of flour, baking powder, sugar and eggs, rolled into balls, deep fried and served in large milk-shake containers – and if that's not sufficiently sweet and calorie-laden enough for your liking, this deep fried Coke is then sprinkled with powdered sugar, doused with cola syrup and topped with a garnish of whipped cream. M&Ms, jelly beans, Mars Bars, Oreos and Wagon Wheels all get similar batter and deep-fry treatment – and for dessert you can go for cheesecake that's sliced and cocooned in spring roll wrappers and deep fried.